Concrete Quality is a revolutionary solution for the concrete industry. With a state of the art technology and a breaking business model, Concrete Quality offers what nobody else does: a universal, standard platform for technical information and expertise exchange for the concrete industry. What makes Concrete Quality the standard for information and expertise exchange? In Concrete Quality we specialize in software for Concrete Quality Control and Concrete Quality Management, and also in software tools for Concrete Mix Design calculation. We dedicate 100% to one thing: to grow and to improve our application. Our software is our only product, and we like it this way. This guarantees that you will always have our full support and dedication to satisfy your needs. Concrete Quality is a modular software. It’s structure lets you decide exactly what you need and pay for. Quality Control: it’s the basic module, it supports the functionality of other modules and you can use it for free for unlimited time. It contains a database with all your data, that you can always access, even when offline and without any subscriptions. We will never charge you for access to your data. Quality Mix: a module specialized in mix design calculation, it helps you create your mix designs in an easy way using the information stored by the Quality Control module. Data Import: a convenient way to import your legacy data directly from your Excel spreadsheets. Create customized templates that will allow you to import all your data by copying from Excel and pasting into Concrete Quality. It’s a must for new users! The American Way: special features for the American & Canadian users. ACI, ASTM & CSA statistics, reports, and more. UK & IE: special features for UK and Ireland, including CUSUM, Batch Book management and audit submittals. Field Test: this is a module that allows you to access your concrete batches’ data while on site. Use any Smartphone or Tablet device to create, query and modify concrete batches, its tests and specimens. Live Support: all users receive free technical support by email within 72 hours or the request. With this subscripton you’ll get priority technical support within 24 hous + Skype/telephone support. Consult the prices and special offers for each subscription in our Pricing page. We are planning on adding more modules with new funcionalities in the future, we are already working on it! Don’t wait any longer! Start enjoying the advantages of working with Concrete Quality. Download it now! 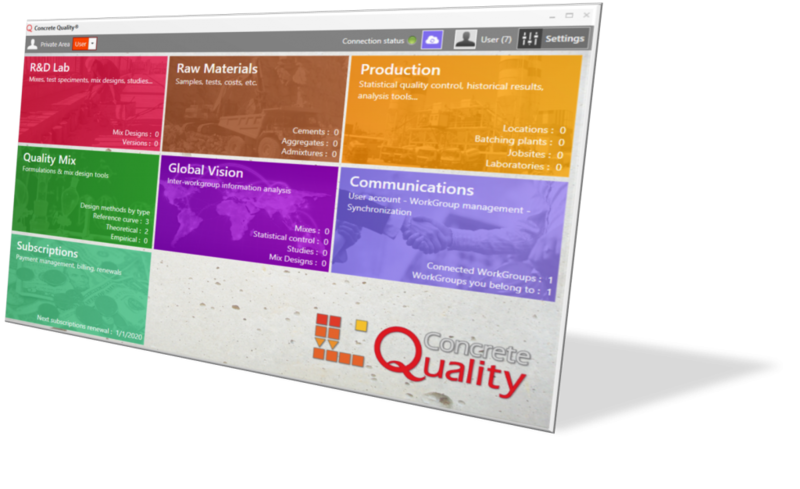 Our Concrete Quality software is designed to be a support tool for all people involved in concrete production, supply and use. This includes engineers, lab technicians, and anyone else involved in concrete quality control. Raw materials suppliers: aggregates, cement, admixtures, etc. We focus on concrete quality management, so our application is (intendedly) not designed for accounting, production machinery operation and control, structural calculations, personnel management, equipment maintenance, invoicing, etc. If you need any of these, it’s very likely that you already have a good application to handle them. We specialize in Quality Management, and we want to give you a product that is very good at this particular task.